A traditional door is easy to install in a building. It is also easy to see money fly out of that door every time it’s opened. Have you ever noticed a short burst of air greet you as you enter a building? That burst of air is caused by a large difference in pressure between the outside and inside air. When you open a door, outside air is pushed indoors and conditioned air is pushed outdoors. The warm air that is pushed inside during the summer, as well as cold air that is let in during the winter, causes a lot of extra work for a building’s heating and cooling systems as it tries to maintain a comfortable temperature, especially in buildings with a large number of occupants. Revolving doors offer substantial savings to office buildings. One of the most unique features about this style of door is that it maintains a constant air seal with the wall of your building, keeping the inside air in and outside air out where they belong. That means only a small fraction of outside air needs to be cooled or heated to meet the indoor temperature level. It is the only type of door that actually pays for itself over time through energy savings. How much of a difference do revolving doors make? 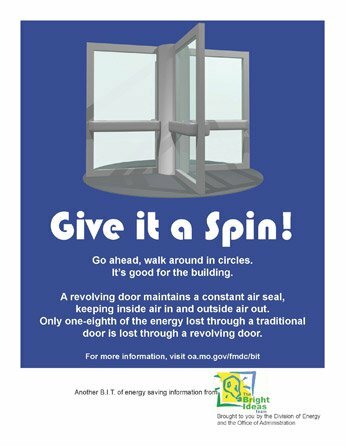 Only one-eighth of the energy lost through a traditional door is lost through a revolving door. What if You Do Not Have Revolving Doors? You can still help save energy when entering and exiting through a traditional door. Prop doors open as little as possible. In buildings with vestibules, don’t leave one set of doors propped open thinking the other set will keep air from escaping. The double door set-up keeps large amounts of air from escaping from lobbies to the outdoors by creating the small space between the doors. When one door is propped open, the air escapes much faster. Refrain from using electronic doors, which should be used only for handicap access, as they hold doors open longer, allowing more conditioned air to escape. By opening doors yourself, you are saving energy with a simple push or pull. Remember to Take Those Energy-Saving Ideas Home! At home you can test to make sure your doors are airtight. There are easy ways you can do it too without needing any professional assistance or tools. Try closing your door on a piece of paper then attempt to pull the paper out from the door. If the paper resists, then your door is well-sealed. If you can pull it out with little or no effort, then improvements can be made. This trick works on windows too! Once air leaks are identified, use weather stripping to seal those cracks yourself or you can hire a professional to do it for you. For more do-it-yourself help on weather stripping, check out the U.S. Department of Energy’s page here. Do You Sleep at Work and at Home? Don't Flush Your Green Down the Drain! Let the Winter Sunshine In!